Strawberry Jello cheesecake is an all-time classic that everybody loves. Try this jello topping for variation because it’s is so easy to make and so delicious to eat. Who loves jello? me me me!! I and my kids love jello. 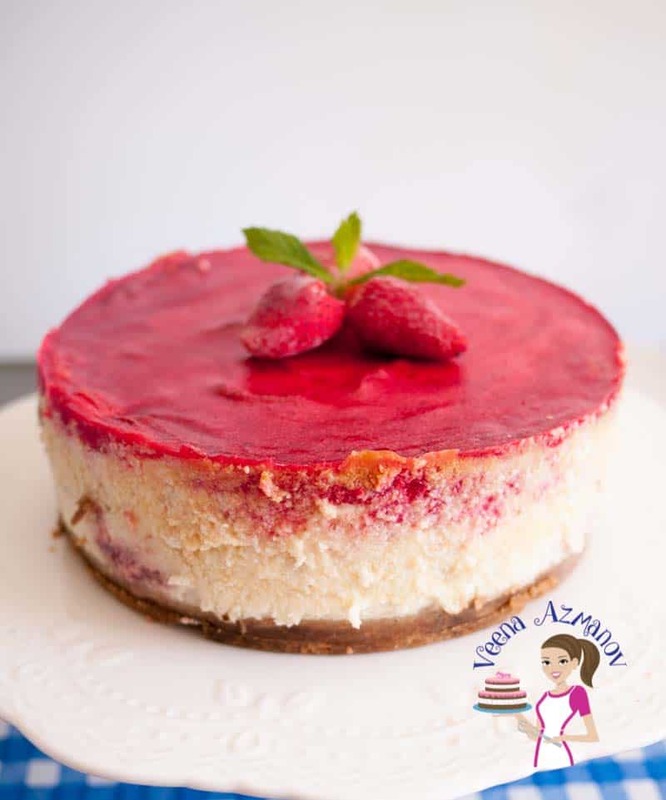 And Of course, we love cheesecake so the two together makes quite a treat, really! Most people think that the base has to be made with store-bought cookies. NO!! You can make a shortcrust pastry dough and bake it like a biscuit before you add your cheese batter to bake. 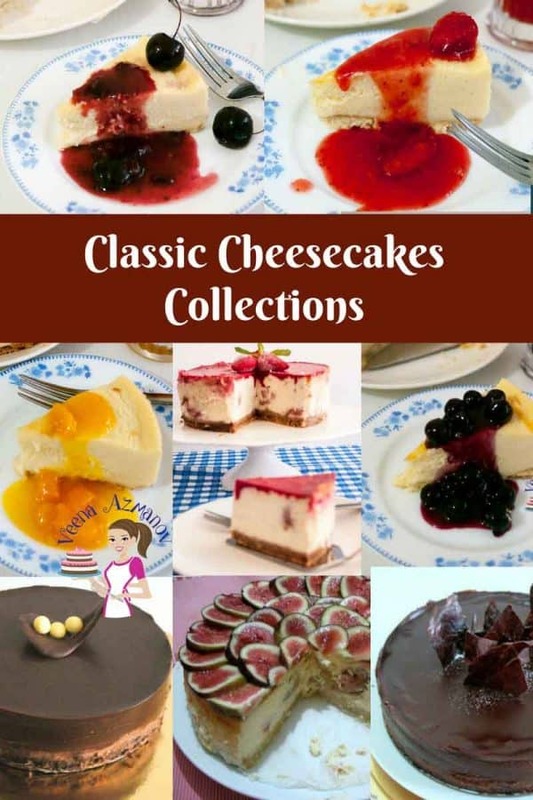 You can find my homemade cookie crust for cheesecake in my other cheesecakes recipes such as Classic Blueberry cheesecake. 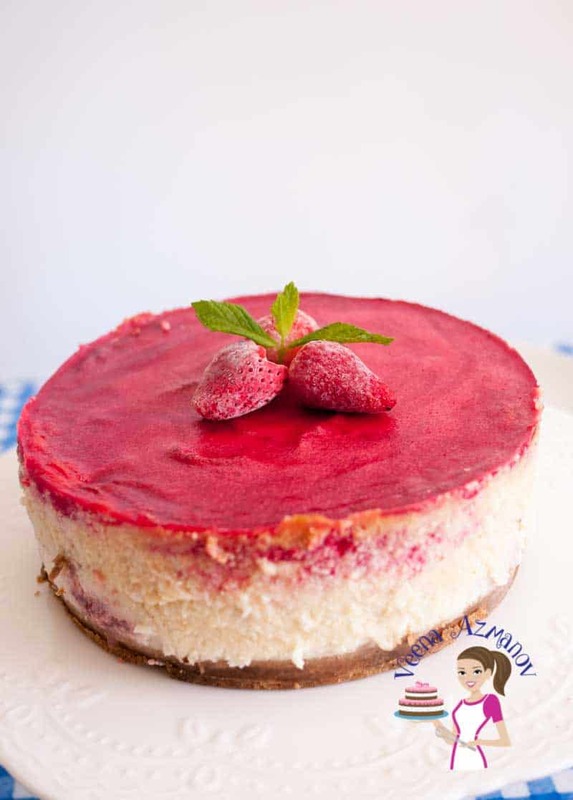 The most important success to good cheesecake is the quality of the cheese you use. I have always used good quality cheese, that is creamy and full fat. Another important tip when making a cheesecake is to remember not overbeat your batter. This is not cake. Cheese is delicate so treat it so. Overbeating your batter will result in a crack on the surface of the cake. I treat cheesecakes like I treat custard. And so almost all my cheesecakes are baked in a water bath; which keeps them moist and creamy. Cheesecake is best served the next day as the baked cheese gets time to rest and set. This gives you beautiful slices and a nice creamy delicate cake. Preheat the oven to 160 C / 325 F.
Wrap the bottom of your spring form pan in aluminum so no water will get into it when baking in a water bath. Crush the digestive biscuits in a food processor or just place in a plastic bag and bash with the rolling pin. Melt and add the butter – mix well. Spread into your baking pan, use the back of your spoon to press it into the base of the tin. Place your biscuit base into the fridge while you make the filling. Clean, wash and drain strawberries. Add the flour (just before adding to batter) and toss well. Place cream cheeses, sour cream and whipping cream in a mixing bowl. Incorporate eggs one at a time making sure each is well combined. Next, add the strawberries (dusted with flour). Place cake pan in a preheated oven rack. Pour one cup of boiling water on the outside of the pan into the rack. This will ensure your cake is moist and fluffy. This is called a water bath. Bake for 45 minutes. After 45 minutes turn the oven off and leave the cheese cake in the oven to cool. When baked you will see the cake is set but still soft. It will first rise above the pan and the sink down. This is normal. Let cool in the fridge for about an hour or two before you make the topping. Place the strawberries in a pan on low heat. Add the sugar. Heat until the sugar is melted and strawberries give out some juice but do not over cook. Just a minute or two. Blend the mixture smooth with a blender. Add to the hot strawberries. Let cool for five minutes stirring often so it does not set. Pour over cooled cheesecake, while still warm. Place in the fridge overnight to let set. When cooled – use a hot knife to release from edges before you open the springform pan. Wrap the bottom of your springform pan in aluminum so no water will get into it when baking in a water bath. Melt and add the butter - mix well. Add in the lemon juice and remaining flour. Bake for 45 minutes. After 45 minutes turn the oven off and leave the cheesecake in the oven to cool. Add the sugar. Heat until the sugar is melted and strawberries give out some juice but do not overcook. Just a minute or two. When cooled - use a hot knife to release from edges before you open the springform pan. You going to love this very much. If you do try – you must come back and brag to me about it. Promise? Love your cheesecake!! 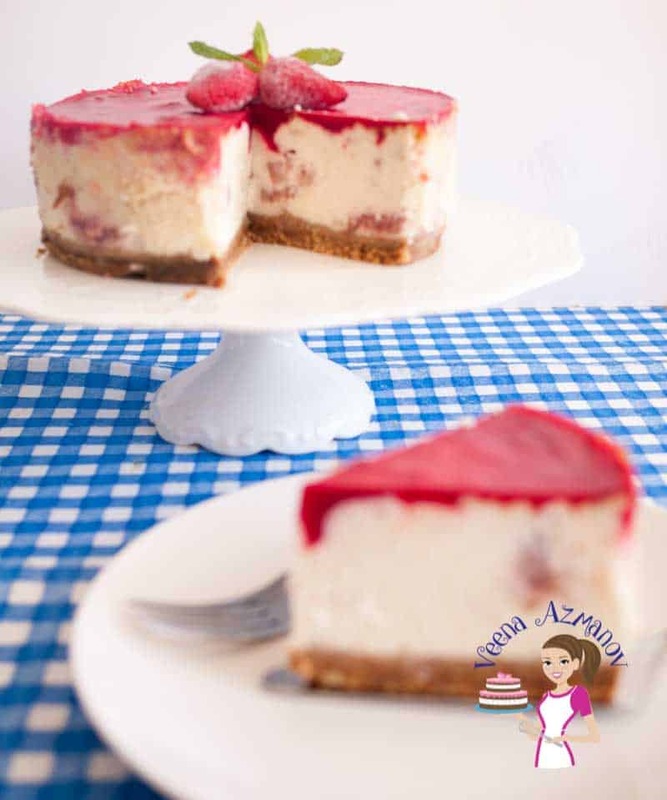 My family is a HUGE fan of strawberry cheesecakes, so I can’t wait to give your recipe a try! 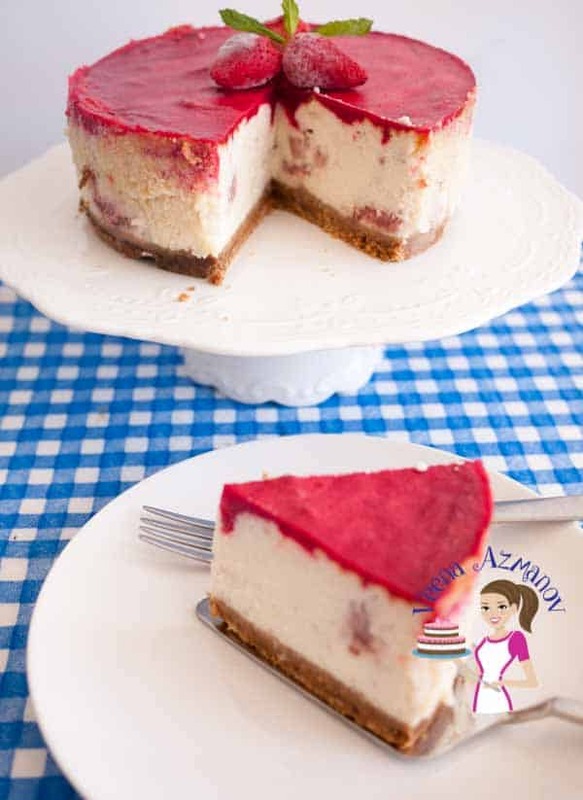 Wow this is one gorgeous strawberry cheesecake!!! I can taste it through the screen. Thanks so much for the detailed instructions… I’m not a very accomplished baker, and appreciate the step-by-step help! Thank you, Katie. yes, it’s very delicious. You must try. Yum! I love strawberry jello – this looks fantastic! Hope to make it tomorrow. 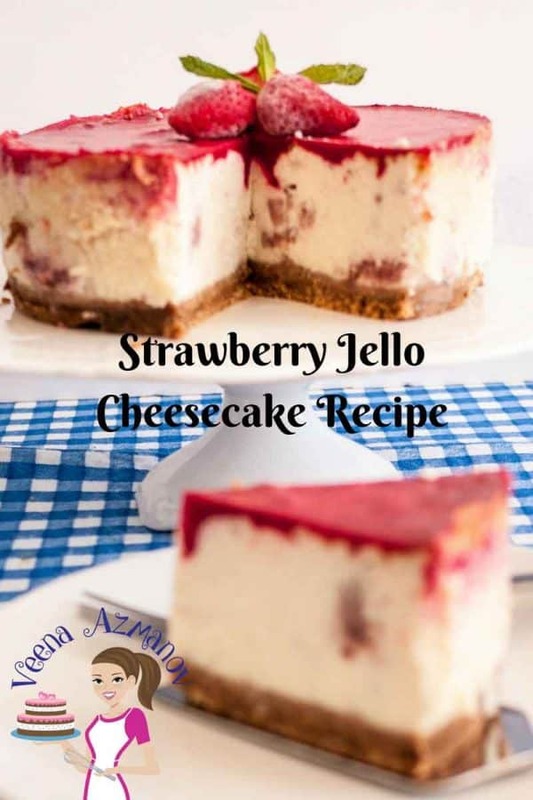 Strawberry cheesecake is my favourite, but I never would have thought of adding jello. It looks very light and creamy. Thank you, Colleen. Jello is the kids favorite. Cheesecake is my main pregnancy craving at the moment. I am going to have to try this! Aww, I use to love cheesecake when I was pregnant as well. But I was off chocolate completely despite being a chocoholic otherwise.. ha…! One of my favourite desserts – this looks so tasty, I could eat it all up right now! Thanks Bintu. Happy to hear that. That looks gorgeous. 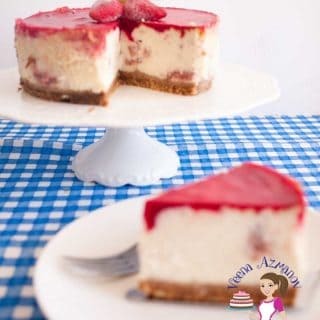 I love cheesecakes, although I usually make no-bake cheesecakes. You can’t beat them. I rarely ever make no bake cheesecake I prefer the baked version more. Strawberries and cheesecake are like PERFECT combo if you ask me. I love how light and fresh this cheesecake looks. Honestly, I can’t wait to make this for my family. I just know all will be thiled. This cheesecake looks simply delicious. I love the bright colour of the strawberry topping. I wish I had a slice right now! Thanks Marie. You must try this. I also think the best cheesecakes have a really good full fat cheese. This one must be incredible! Thanks Tiffany. I agree a good cheesecake must have full fat cream cheese for best results. This cake is beautiful! I can only imagine how amazing it tastes! Your sweets and desserts look so mouth watering. Someone at your place is lucky :)Very detailed and thorough recipe too. this is so pretty! I would love to show this off at my next get together. how impressive! Thank you Catherine. Wish I could send you some. yummy! I got to try this strawberry cheese cake! You must try Priya – it’s easy! 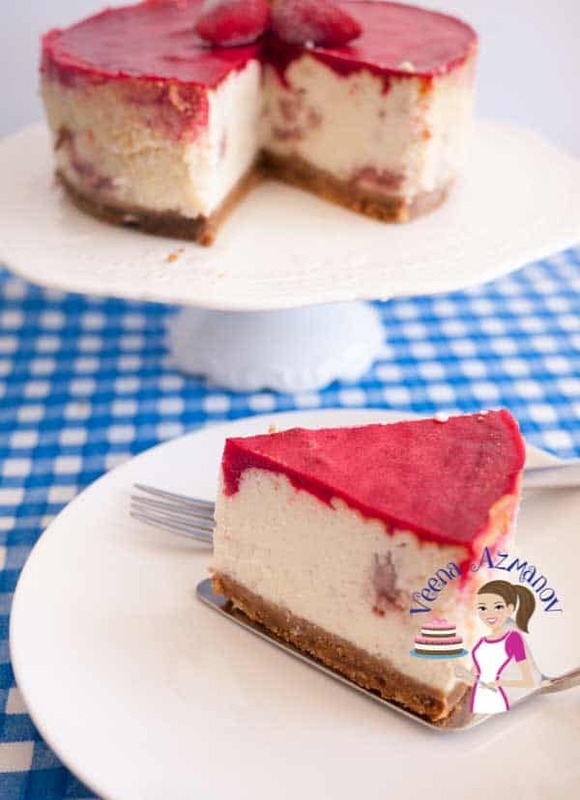 Love this cheesecake Vena, Have to definitely try it one day. Saving it. Thanks for this. 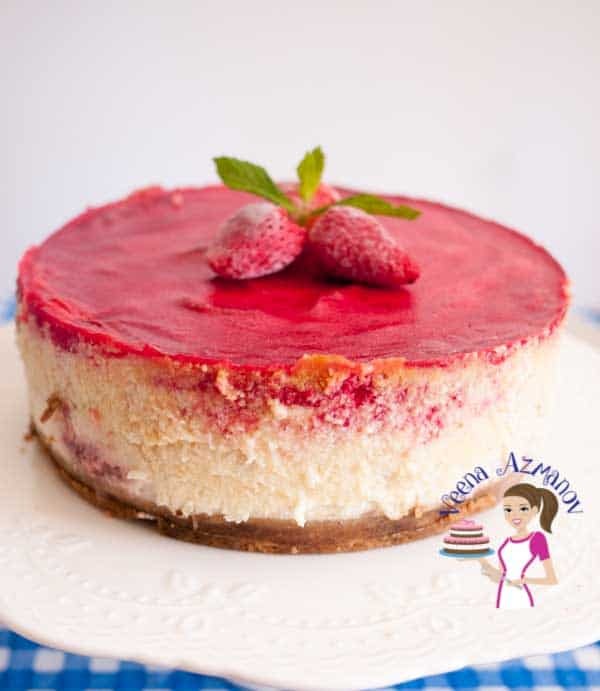 Can you believe that I have never made a cheesecake! This looks like a really simple and delicious one to start with.